Drag Racing Central: Mitch Myers, Epha and Codi Frazier !! Mitch Myers, Epha and Codi Frazier!! 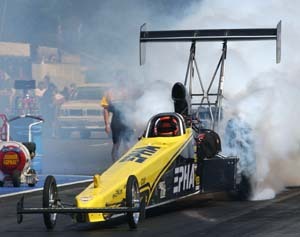 Mitch Myers runs a Top Alcohol Dragster that has the name “Epha” on the side of it. And, if you look closely, you’ll also see the name “Codi” on the back of the injector scoop on Mitch’s car. So what do Mitch, Epha and Codi all have to do with one another? Well….. The “Epha” on the side of Mitch’s car refers to the family owned company, a firm that makes hose protection equipment and has customers in over sixty countries around the world. “General Dynamics, Bluebird Bus Company, John Deere and Freightliner are just some of our customers. We have up to fifteen employees but we have over 100,000 open door distributors around the world.” The name of the company is in honor of his grandmother, Epha. “A lot of people think it stands for something, like Environmental Hose Protection Association or something like that,” Mitch said. “But after submitting several names to the state and getting all of them rejected, we decide to honor my grandmother and name the company after her.” The “Epha” Top Alcohol Dragster has been running very well lately and the team recently won the Division 6 race in Woodburn, Oregon and they qualified tenth at the national event in Sonoma this past weekend and went to the semi-finals. Those two highlights were sandwiched around a very rare DNQ at the Seattle race, but Mitch knows that not qualifying for an event isn’t the end of the world, and that’s where Codi comes in. Mitch Myers is the first one to admit that things are pretty good for him. His wife, Debbie, runs a flower shop called “Petal Pusher” in their home town of Hermiston, Oregon, and she’s his biggest fan even if she doesn’t come to the races a lot. “We’ve only been married for seven years but I’ve known her since the ‘70’s. 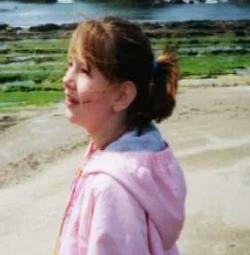 She used to hang out with my older sister, Teresa. It’s funny, I’ll call her while I’m at the races and she’s working at the store and she’ll tell me all the things I have to do when I get home and not even ask about the car. But she supports everything I do with it,” Mitch says. His son, Bill, and son in law Cassidy oversee the daily operations of “Epha” and he has two daughters, Nicole and Heather, a step son, Chadd and his mom, Sylvia. His father, Bill, retired after years of working as a general contractor, also works with the team when they’re at the races. “Dad was instrumental in the start of EPHA, as it was his years of working as a contractor that provided the seed idea for our beginning product line the Hose Protector. If it were not for the sacrifices of my parents and many others on our business team we would not have succeeded. Like I said, I’m very fortunate to have the support that I do. I only hope that our family can pass some of this love on to Codi and make her life a little brighter.” But, as often happens in cases like this, Mitch goes on to say that, surprisingly, it’s usually Codi who brightens his day. “Just to see her smile can turn your day around,” he said. Mitch Myers and the “Epha” dragster may be racing, but everyone on the team is all thinking about and praying for Codi Frazier.